Since it’s establishment in 1989, UTI’s mandate has been to unify the “world” and “international” styles of TaeKwon-Do in the natural evolution of the art. Our goal is not to unify the WTF and the ITF politically; rather, it is to develop a style of TaeKwon-Do which incorporates the best from each of the two styles in a unified and superior method of training and education. Grand Master Kopperud began the unification process by introducing a “step-sparring” curriculum which incorporated movements and combinations from both the “world” and “international” styles of TaeKwon-Do. These step-sparring combinations are a critical part of rank advancement and are suitable for use with either the WTF or ITF sets of forms. GM Kopperud then established a superb rank-based “self-defense” curriculum, which incorporated techniques from other grappling and self-defense arts, and which continues to evolve as we learn more and more about the body and how it works. Thirdly, UTI developed a unique set of rank-based “four-direction-kick” drills, exclusive to UTI, intended for use throughout the color-belt curriculum. The final phase of UTI’s curriculum evolution has been the development and implementation of our own set of “forms”, superior in design to previous forms, and suitable for use in “unified”, “world” and/or “international” style schools. 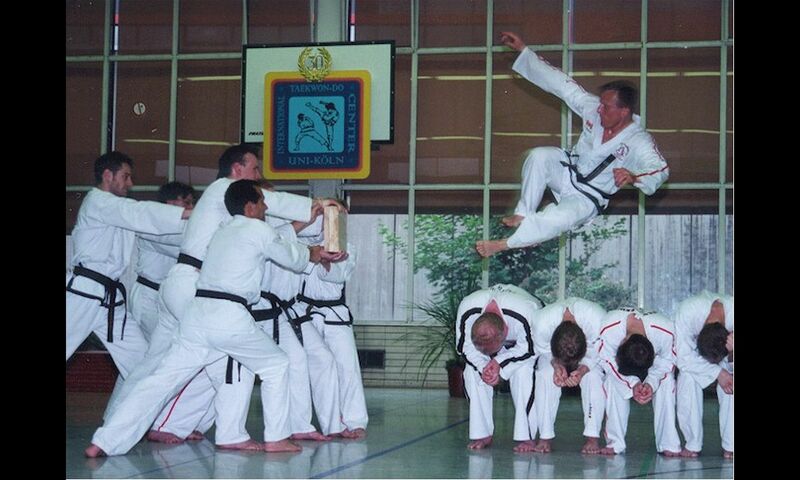 Unified Forms utilize movements from both the “international” and “world” styles of TaeKwon-Do in conjunction with its own unique, superior and more effective methods of training. For example, the 1st form ALPHA (the Greek word which means “beginning”) consists of 24 movements, representing the 24 hours of the day, indicating TaeKwon-Do training is continuous and never-ending. This form incorporates movements from both the ITF International’s Chun-Ji form and the WTF World’s Taeguek #1 form, as well as movements from UTI’s own step-sparring combinations and 4-direction-kick drills at the beginner, white-belt level. STORM, UTI’s 6th Official Form, incorporates all new movements from the ITF’s Gwang-Gae, Po-Eun and Ga-Baek forms as well as the WTF’s Keumgang form. The 94 movements of STORM include a 100% symmetrical display of 1st Dan Black-Belt training. are completely symmetrical: This makes them easier to learn and provides balanced physical and mental training for the student. begin and end on exactly the same spot: UTI uses the natural directions of North, South, East and West in conjunction with a T-Line (west & east) and a centre C-Line (north & south). The intersection of these lines marks the spot where each form begins and ends. begin in a different position than any other form: This makes each form easier to learn and easier to recognize. end in a different position than any other form: No two UTI forms begin or end in the same way. have a unique and universal meaning: The meanings’ of UTI’s Official Forms are unique and universal, appropriate and suitable for use within all settings, schools and cultures. incorporate all new movements from both the ITF and WTF forms from the same level. are designed to be viewed from the front (north) position: This makes the forms easier to teach, easier to recognize, and much more suitable for use in examinations and competitions. take less space than most other forms making them more suitable for instruction in group sessions. designed for use at particular rank levels: UTI color-belt forms are designed for use through two Gup-rank levels. For example; Alpha is practiced by the 10th & 9th Gup rank levels, Sun, UTI’s second form, is practiced by the 8th & 7th Gup rank levels. UTI has developed one Black-Belt form for each “Dan” level, 1st to 4th Dan, concluding with UTI’s 9th form Omega, which is practiced by the 4th Dan Black-Belt and higher. UTI does not have a handful of “higher-level” forms which very few would practice or even learn. The movements from Unified TaeKwon-Do’s Nine Official Forms include all the movements from all the official ITF and WTF forms combined. UTI has developed and presented our forms, and they are practiced to this day, in more logical, practical, applicable and efficient ways than ever before. Grand Master Kopperud’s unique and comprehensive forms are designed to be the suitable replacement for either/both the ITF and WTF forms. UTI’s all-inclusive forms easily stand on their own but can also be used in conjunction with curriculums already in place. Instructors who are dedicated to the development and betterment of TaeKwon-Do, and to the quality of the program they offer are quick to include UTI’s forms in their schools and organizations. When practitioners and instructors of TaeKwon-Do realize and experience the superior quality of the UTI curriculum and UTI forms, they are quick to use them exclusively.